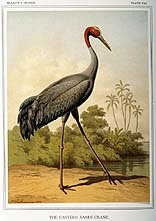 As is evident, the Hill Collection contains an impressive amount of important historical ornithological literature. Only a selection of titles in the collection appears in this guide. Complete listings and bibliographic records may be found in thenational library databases, in Cornell University Library's Online Catalog, and in the Hill Collection online database . A substantial collection of ornithological reference works, bibliographies, and histories provides full support for the Hill Ornithological Collection. The classic rare book bibliographies commonly cited in ornithological catalogs and literature are housed with the Hill Collection in Cornell's Rare Books and Manuscript Collections, as are specialized descriptive works concerned with one particular artist, such as Audubon or Gould. This support material for the Hill Collection, in combination with the reference tools available in Mann Library, provides the user of the Cornell University libraries with an array of ornithological reference sources second to none in the nation. Because of their rarity or value, the books in the Hill Ornithology Collection do not circulate, and may be used only in the rare book reading room in Kroch Library. These restrictions are not meant to discourage use; rather they are intended to ensure that these valuable works remain intact and available to future generations as well as to present-day students, scholars, and researchers. Cornell invites any person with an interest in consulting these books to contact or visit the Hill Collection in the Division of Rare and Manuscript Collections in the Carl A. Kroch Library.